Echo Point Books & Media, 9781635615043, 306pp. With less total fat, more heart-healthy omega-3 fatty acids and more antioxidant vitamins than its grain-fed counterpart, it's no wonder grass-fed beef is leaping in sales. 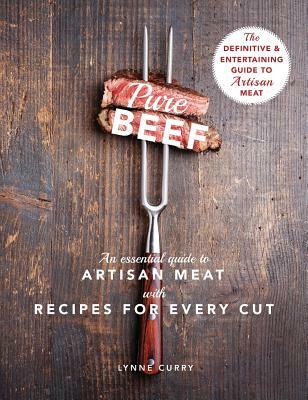 In Pure Beef, author Lynne Curry answers every home cook's most important questions about this leaner variety of meat, including how to choose, where to buy and how to prepare it. Featuring a cooking tutorial and an informative beef cut chart, this essential guide explains the difference between grass-fed and grain-fed meat and offers instructions for how to grill, roast, stew, simmer and saut every cut of artisan beef to perfection. Chapters are organized by cooking methods and corresponding beef cuts, and feature 140 mouthwatering recipes for everyday favorites - from shepherd's pie to pot roast - as well as global cuisine, including Korean barbecue and Turkish kabobs. This cookbook also includes a full-color photo recipe insert and landscape images throughout. Curry is a former vegetarian who learned to love locally raised beef after moving to Oregon's remote Wallowa Valley in 2001. Her groundbreaking guide to artisan beef is a must-have for every meat eater who wants a sustainable ranch-to-table dining experience.